Last year I hosted a small promo/coupon with Zeropark (Thanks to Neill and Mateusz) and over 70 people signed up and got a great bonus that matched their initial deposit. But many people kept asking me if the coupon could go back again and again. So it’s been 1 year already but we’re again launching this coupon with my great manager (Neill Burton) and I’ll be providing you guys with a complete review and live case study on how to make the most out of Zeropark’s traffic and new features being introduced in 2016. This coupon is time sensitive so hurry up if you really want to take advantage of it. 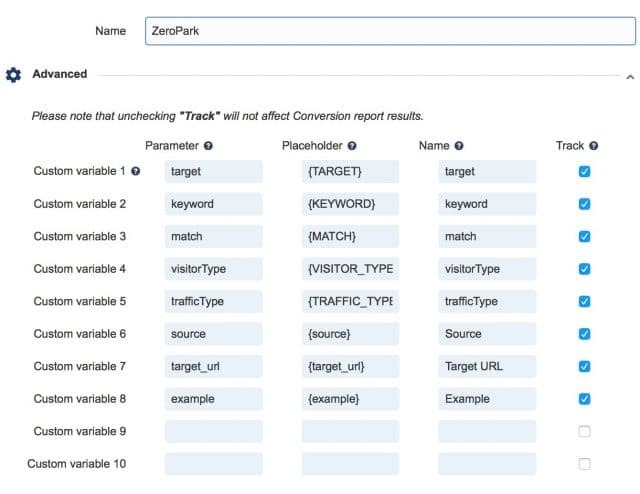 Zeropark is still one of my go-to traffic sources when I want to test a campaign with pop traffic because their interface and drill down optimization options are better than most networks with self-serve platforms. I’ve spent over $200,000 there and while I work with dozens of traffic sources at the moment I always test my campaigns in Zeropark at an initial stage or even when scaling. Your account MUST be new. If you’re already working with Zeropark and spending money this coupon isn’t for you. Your CAN USE the coupon if you had already signed up but never deposited funds in your account. The promo will match up your initial funds up to $500. Minimum deposit is $200. You need to leave a comment in this article with your name and email so I can validate (manually) your coupon. The promo WILL EXPIRE in August 7th 2016 (30 days duration). They will match up your initial deposit and double it up to a quantity of $500. If you want to deposit more than $500 they will still give you another $500 but no more (e.g. deposit $1,000 and get $1,500 total). After that please just leave a comment below so I can manually add you to a list and validate it. The Zeropark team might take a couple days to match your funds but you’ll eventually get it. Don’t be impatient. Also, if you’ve already signed up before but you’re going to deposit your first funds just leave a comment here in the post with your name and email so I can manually add you to the coupon list. Finally, if you’ve already applied in the past months but were rejected by any reason and could never sign up with Zeropark, this is your time! Again, just leave a comment below with your name/email so your account can be reviewed again and approved to get your coupon. P.S. Being rejected while applying is NOT THE SAME as being banned. If you had an account that was banned because you broke the rules I can’t do anything for you. Sorry. A lot of people here are still learning how to launch their first campaign and optimize it. I’ll create a follow along with the optimization process at the AffiliateFix forum so you can follow my journey, but if you have no idea how to launch your first campaign here’s a small walkthrough step by step. If you’ve already launched campaigns you can completely skip this part and wait for the updates and live case study in the next post. Otherwise, if you have no idea how to setup your tracker or how to create a campaign keep reading. This is your Zeropark’s dashboard. 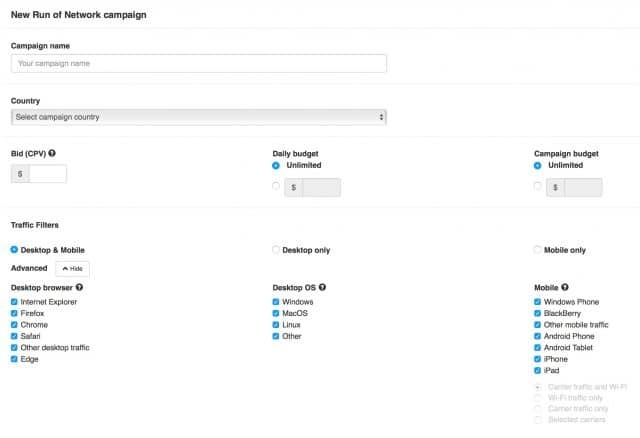 Here you can check your stats, your funds and create/duplicate/delete campaigns. The dashboard shows the traffic spent and conversions (if you use Voluum or setup your postback) and the user interface is quite easy to understand. If you click the “Top up” button at the top -right corner you will be able to add funds to your account which will be later doubled thanks to the promo. I’d definitely consider adding $400-500 to take advantage of the coupon. 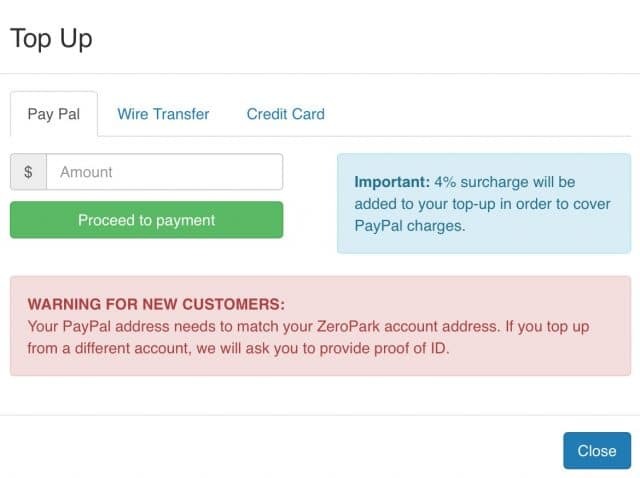 Zeropark accepts payments via Pay Pal, wire transfer and Credit Card, however this last option requires you to be a recurring member. I still recommend you get the credit card option after a few deposits by talking with your manager because the transaction fees are lower with credit card than Pay Pal. Once you’ve added funds to your account you are ready to launch your first campaign. You will need a tracker to track all the stats and tokens with Zeropark. If you already know how to use a tracker then this will be no problem for you, but if you’re new or haven’t decided in which tracker to use, the one I recommend (and many super affiliates use) is Voluum. You can sign up for a Voluum’s account here. Zeropark is already integrated within Voluum’s traffic sources, however, Zeropark recently added new tokens to track and if you have an old Voluum account you want to make sure you’re tracking everything. Open your traffic sources and edit the Zeropark traffic Source while adding the following custom tokens. Now that you have your tracker ready and your account funded you just need an offer to promote (you can find great networks to sign up for offers here) you can proceed and create a campaign in Zeropark. Click the “new campaign” menu and select one traffic type. Domain traffic is redirect traffic from misspelled domains (e.g. people type gogle.com instead of google.com). Search traffic is similar to Bing and Adwords. I normally use Domain and PPV traffic with Zeropark, but you can give Search traffic a try. Next you need to define your campaign targeting options. RON traffic means you’ll buy all the traffic available for that country/os and you can optimize by deleting the websites that don’t perform well. This campaigns have super high volume and can spend hundreds or thousands of dollars in just an hour. Keyword traffic means you’ll only receive traffic from the keywords you add and nothing else. This can helo you create very targeted campaigns but at the expense of having less volume available. 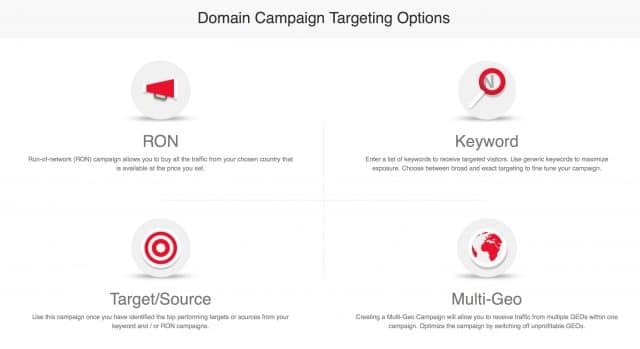 Target/source campaigns allow you receive traffic from specific websites or group of websites (source). I like using this campaigns after running a RON campaign and finding which websites perform well for my offers. Multi-Geo has less targeting options and the main difference is that it allows you to target multiple countries at the same time. I wouldn’t recommend this option if you’re a new publisher, but it can be handy when you want to quickly test an offer that’s available for multiple countries. After clicking next you need to fill up your campaign name, country, bid, etc. Before that, go to the traffic planner and check the traffic available for the country/offer you want to promote. 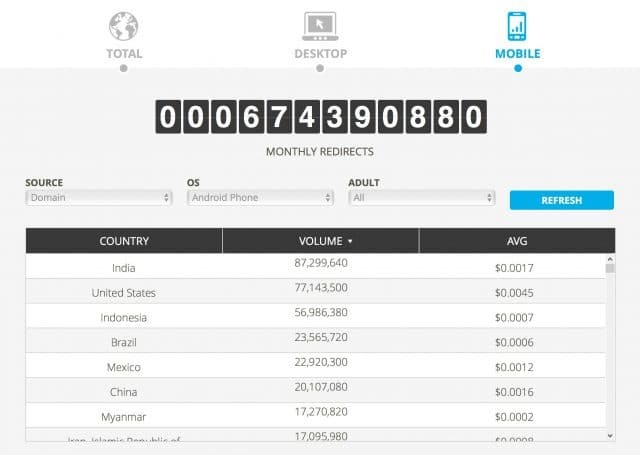 The stats shown are based on monthly data, so for example, in the screenshot below I selected mobile traffic from redirects available on Android phones. If I wanted to buy traffic from Mexico now I know that there are around 22 million visits per month available and the average bid is 0.0012. You can select PPV traffic, change the OS if you want or maybe select desktop traffic if that’s what you’re looking for. Also there’s a filter for adult and mainstream traffic in case you want to promote adult offers. Please understand that you can’t promote adult offers on mainstream traffic for obvious reasons but you can promote mainstream offers in adult traffic if the offer allows it. Going back to your campaign now it’s time to give it a name (e.g. China Mobile Domain Android) and fill the rest of the data. Select the country you want to target and in the bid field write down a bid around the average bid so you can get enough traffic. For example, if the average bid for Mexico/Mobile/Domain/Android was 0.0012, I’d bid something between 0.0010 and 0.0015 to get started. Also don’t forget to set your daily budget because some people have forgotten to write a number there and Zeropark spends all the money from their account in a matter of minutes if the volume is available. Finally, you can put a campaign budget (I leave that unlimited) if you want. Now you just need to select if you want desktop or mobile traffic and if you want to target specific browsers or OSes you can do that too. Scrolling down a bit you can select a frequency filter (how many times per day is your ad shown to the same user) and I normally leave that at 12 or 24 hours. Add the adult filtering if you want and day parting but I wouldn’t do day parting before gathering some data. Finally put your destination URL (Campaign URL from Voluum) and click the save button. The Zeropark team will review your campaign and you’ll see traffic after approval. Keep in mind many traffic sources have office hours and if you submit a campaign Friday’s night there’s a chance it won’t be approved until Monday’s morning. I’ll create a few campaigns and post them in a follow along in the AffiliteFix forum next Monday, so stay tuned and sign up meanwhile to take advantage of the promo before August 7th 2016. I’ll write small updates every week here but most of the live campaign action will happen in the forum. I’ll send you the link and info when it’s ready. hi,~the coupon is still working? The coupon is expired already. 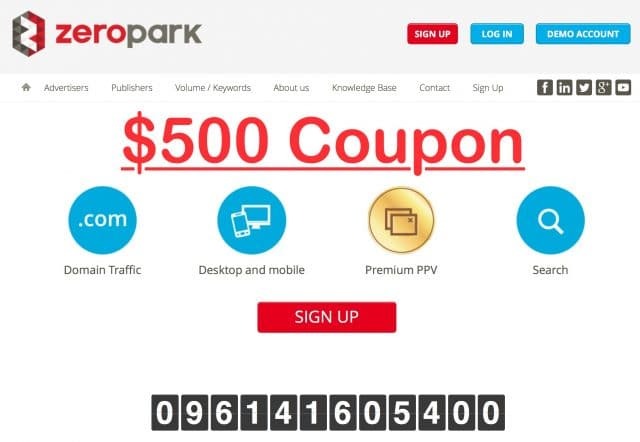 Still got a coupon for zeropark? No, but the one from SelfAdvertiser is still working. How about zeropark now? Red50onRed (RTX platform) has no good traffic, LeadImpact is closed. What about zeroparK? Any suggestion? 50R still has some decent traffic. Zeropark has a ton of traffic as well and Propel Media is still alive. Is this coupon still work? Can you please give me a coupon? i just have been approved on zeropark. This coupon expired long time ago. Sorry. Hi servando, i would like to start working with zeropark, 2 days ago i sent an account request to zeropark and it was rejected. They’re very strict and you really need to pass the interview in order to get approved. The only time when i can help you is when we run a promo and they’ll get a special treatment for my readers. Hi servando, Do you plan to launch a new coupon? do u have any coupons for now or for other traffic sources ? Nice news to have a new coupon coming soon. Will be nice to not leave our names & Email displayed publicly in your comments to get the code. If you find an easy solution for this, it’s ok but if you don’t, that’s ok too. See you soon and thank you for sharing your precious info with all of us. It really helps. I might just edit the comments now. I have a new way to do so with the new promotions though. Sorry to bother you again but as I’ve missed your previous promo, I really want to give a try with this network and test your stuff with Domain and PPV so, do you expect to launch your promo in the next “few days” or later during the summer ? Definitely not in the next few days. I’ll probably launch it again in the summer like the last 2 years. Why don’t you try the other promo I have running at the moment with selfAdvertiser meanwhile? Yeah, I’m trying it right now with your coupon. For ZP, I will have to be more conservative and start slow then, I think I cannot wait till this summer, no problemo. I don’t have one at the moment but I’ll talk with them so I might get a new one soon. Hola Servando, acabo de registrarme, aunque el cupón ya caducó, al menos si no puedo beneficiarme de él, te escribo para que me eches una mano con la aprobación si es posible. Hola. El cupón iba de la mano con la aprobación. Si te aprueban ahora o no ya dependerá del equipo de revisión y el cuestionario. Ellos manejan una buena cantidad de tráfico adulto, aunque otras opciones son Plugrush, Ero Advertising, TJ y Exoclick. Awaiting account verification with ZeroPark. The promo ended up 2 months ago man. Sorry. I applied but got rejected.I want to apply now so should i apply rom the same email id and details or new details by applying your coupon code? The coupon expired last month. It’s not available anymore. Sorry. Hello , please is there any coupons available for now ? Hello. No. The coupon expired in August. Sorry. I think about signing up Zeropark but I’m not convinced. Do you have any more coupons? Hi. The approval process is checked by Zeropark’s team. Also, the promo is over so i can’t do much there. That’s something they check person by person. But in general, networks look for people who have money to spend on campaigns (at least a budget for every month) and an idea of which type of offers and verticals they want to run. They will ask you some questions and depending on your answers they decide if you can be approved or not. Hi Servando, I just singned up! I know it’s late but still I wanna get started with Zeropark, Can you please help me to get approve. I just re checked and you’re approved. How much did you deposit initially? OK, your bonus should be ready now 🙂 Please confirm. Hi there, I recently applied for Zeropark and got rejected. I’ve even asked the reason why they rejected me as I am a member of a few big name advertisers like Bing Ads, Adwords, 50 on Red, etc. Kindly help me get approved again. Hello. The promo and manual reviews expired last week. No more sign ups are being accepted through my referral. Hi. This promo expired a week ago. No more sign ups or coupons are being accepted at the moment. Yeahmobi has low payouts if you need some cashflow to get started. Awesome, I got the bonus. Thank you so much! BTW, what kind of offers would you recommend to a beginner? The traffic source is ZeroPark and I’m thinking about app installs or sweeps, maybe pin submits. What’s your advice would be as an experienced affiliate? I’m working with ClickDealer. Thanks! App installs to start learning the ropes and then move to sweepstakes. Thank you! If you need any help with translating/proof-reading Polish, let me know. I’m always happy to help and return the favor. You can see my email, right? Feel free to write with anything you might have for me. Sure. I’ve read every post here. It’s great because your posts cater mainly to the beginners. Thanks. Hi Servando, we signed up Saturday before the deadline on the 6th, didn’t realize it took this long to get the account opened. Can you verify? ‘a d m i n (aat) 9 2 k e y s . c o m’ – Thanks! Sorry, the coupon expired 3 days ago. If you were not in my list before that I can’t do anything for you. Maybe next time. I missed out on commenting here. Sorry, the coupon expired 3 days ago. If you were not in my list before that I can’t do anything for you. I actually had emailed Agata. Agata wanted to check if you could add the name (as the account is created before the expiry). Hopefully this can be done! I just checked with here and there’s nothing she (or me) can do since the promo is now over and the rules were clear about it. Sorry, but the promo ended 2 days ago. It’s not available anymore. Very sorry. :( Will bonus promo in the future? Maybe next year. I did one last year too. I deposit 500$ Sir. still havent got the $1000. could you please check? Hi Servando. I got a campaign has been running for 5 days and the ROI is about 0%. My bid is about 1/3 avg. I tried raise my bid to avg bid but ROI turned out to be -40%. Am I supposed to keep the high bid then filter out the bad targets? Why the ROI dropped so much after raising, is it common? Daily volume on this camp is about 20k on 1/3 avg bid, is it be too low to analyse? Thanks so much! Depending on the targets and the bids it could go up or go down. how much did you raise it? I’ve just created an account. Thanks a lot and great promotion! Hi, I would like to take full advantage of this bonus, so might not be able to deposit money rightaway. Is there a time limit for depositing money and getting bonus once your account has been activated and validated. Thanks. As long as you have been added to the list before the end of today you apply for the bonus. It doesn’t matter if they approve you tomorrow and you deposit on Wednesday (for example). You just need to be on my list before the end of today. Hi Servando.I just signed up.My name is Christopher and my email address is qualityservicechris@gmail.com.Thank you kindly!!! I have added you to the list. The account validation is up to Zeropark’s team. Hello, I hope today the offer is still available. Thanks! Hey Man, I just signed up! Waiting to be verified. Please add in your list. OK, Let’s see if they can approve you now. I’ve added you. Hi Servando, just signed up for an account! I want to take advantage of the bonus offer. What should I do? I have added you to the list. You should wait until they approve your account and they’ll let you know if you apply for the bonus or not. Please wait until they contact you. Hey Servando, so I was rejected about a month ago by zeropark.Full name Rishi Makan and email is rmakan@gmail.com . Hopefully I can still be added and be able to use the promo even though its the weekend and promo expires tomorrow. Hello. i added you to the list. Let’s see if they can approve you now. Yes, the promo is still live until tonight and if you’re in my list it doesn’t matter if they take a bit more to approve you and send you the email for the coupon, it will still be valid. OK. I’ve just added you man. OK, looks like your account is approved and you can apply for the coupon on my end. My manager will check it personally next Monday. Thanks mate. Please apply the coupon. So that i can start using the account. My manager will check it on Monday as mentioned above. Pleas ebe patient. Thanks! Hi Servando, thanks. However, account still pending verification. Just afraid will miss the deadline to deposit money! Your account is ready and approved. You can deposit now for the bonus. Thanks, I just deposit. When will get the bonus? Awesome, get the bonus! Thanks so much! Hey Servando, could you please validate me too? Hello Servando. I have just signed up. My email address is teddy_h@pacbell.net. My account has yet to be approved. Truly appreciate it! Thank you so so much! OK. You’ve been added to the list. Thanks. Hi Servado, I’ve just signed up! I’m still waiting for approval. Should i send them an email with the information they requested? Or by accessing your list, they automatically approve my account? Hello. I’ve just added you to the list. They will manually check your account and send you an email to know when you can apply for the bonus (or not). registered with your promo code and rejected. my account activated, is this email confirmation for your bonus ? Yes. that’s the one 🙂 You can now deposit and get the bonus. Thanks Servando! I just signed up. @servandosoyongsilva:disqus thank you so much for the coupon. so, do i have to top up right now or i have to wait something from you before?? Hi. i have added you to the list. You need to wait until they approve your account and they’ll send you en email so you can get the coupon. thank you Servando! Your activation mail say i have to answer some questions… do i have to do it and wait for approval before top up?? but tomorrow is 7th… 🙁 will be loose the coupon? Or maybe we wait for the approvaal and then we top up? Yes, please answer the questions and they’ll manually review your application. You won’t lose the coupon as long as you’ve registered before the 7th and you are in my list (you are already). Thanks! Mail sent! Waiting for the activation! Account suspended this is what I am getting after adding the money. Also no bonus yet. Please check mate. What’s the email you used to register? I’ll check it personally to see if your account is still pending. Hey mate, Signed up already. Waiting for the bonus funds. When i click on process to payment it redirect me this page(Attached Image). and there is 2 option. 2.pay with a dabit or credit card. So if i choose option 2 and send payment then is it okay ? And i have created account couple of days ago… Although haven’t deposit yet. so if i make deposit now then will i get bonus! Both are actually paypal, so no matter what you chose the processor is still paypal. As for the bonus, you need to wait until I add you to the list and they send you a confirmation email for the bonus. In your case, I can see your account was approved for the bonus is my list though. Did you receive their email? I have registered on zeropark with your promo code. I signed up yest, pls add me to your list. Hi Servando , signed up . I have just added you to the list. They’ll check it manually to see if you can be approved. Thank you very much, I will confirm you if they accept me. Hi Servando, Just got email from zeropark and they accepted me, thank you again. Have you been approved? I can see your account is approved in my list. Has this been solved? i just checked and your account has been approved and I can see you deposited those $200 so they should give you the bonus. How then? Any tutorial step by step? I’m still newbie in AM. Can i add you on skype mate? Yes, the tutorial on how to launch your first campaign is exactly in this post mate! Also, check the AffiliateFi Case study. No problem. You should be able to get your bonus now. Got it. Thanks. You’ve been added. How long do I have to wait for the email coupon? Could I deposit first or no? Since your account has been approved they’ll send you an email soon. You can deposit now. That’s weird I haven’t received a coupon email yet. can they resend it to me? They don’t work on weekends so probably tomorrow. I just send your email to my manager so she can check it personally. Hi Servando, I have just signed up with ZeroPark. ZeroPark just rejected my account application. Can you help? Thanks! Are you sure? Your account was approved and you actually deposited $300. Is everything fixed now? Yes, all is good now. Thanks! I have applied and deposited $500, then my account was suspended! Took a bit effort to get my account back but still haven’t seen the bonus yet. Can you please double check for me? thanks! I just checked the list with my manager and you had an account before, so the promo doesn’t apply for you. Thanks. Sorry, but they’re saying it’s not a new account. You had an account before with another email and they know it so it doesn’t count. I just signed up last week. And I’ve just added you. Great. You should receive an email for the bonus soon. When could I receive the bonus? They will contact you when you’re approved and the bonus is available. They’re taking a couple days to check everything manually. Hello Servando, just signed up. Please include me for the offer. Thanks. Hello. I’ve just added you. I applied for an account and got an email this morning saying that it was rejected. Can you lease help me to get in? OK. I have just added you to the list. OK, just added you to the list. Hello. Did they send you the email to confirm you apply for the bonus? My manager is out but she’ll come back in 2 days and sort out all the pending payments. Yes. She’s out of office and she’ll be back in August 2nd. How much did you deposit? Please add me. Thank you so much! I just had an email exchange with the ZeroPark support. I thought it was OK, but in the end they rejected my application. Is there something that can be done? In my list I haven’t seen your account updated yet. Let me ask my manager now that she’s back tomorrow. Stay tuned. I think your account has been approved now, so you shouldn’t have a problem. Did you receive the email for the bonus from Zeropark? Yes, it’s approved, thank you. I asked for the Credit Card payment option today and I’m waiting. The deadline is the 7th of August to make a deposit or just to sign up your new account with the coupon? I’ve just registered with your code and I’m excited to get started and use your bonus! OK, I’ve just added you. Hey Servando! Just signed up. Thanks! Just added you. You need to wait until they confirm your bonus though. Do you mean that I have to wait until they confirm my bonus, then add 200$ ? How to know that they confirmed my bonus ? They will send you an email when your account is approved for the bonus. When did this happen? I don’t think they have reviewed you manually on the list yet as my manager is out of office and will probably check it on Monday. No, please wait until your account is activated and they will send you an email to confirm the coupon for you. Hi Servando, I had just signed up. I hope I still have time to use this Promo. Yes, there’s time. I’ve added you to the list. Hi Servando, just signed up! Your details have been added to the list. 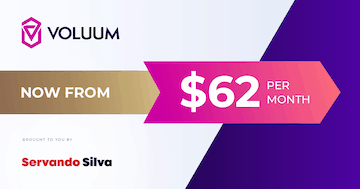 Hi Servando, I heard Voluum accepts traffic from ZeroPark for free but after signing up Voluum I found it cannot proceed if not choose a plan and pay. Do you know what’s going on? Yes. What it means is if you get the $99 plan which has 1 million events available but you use Zeropark, those events won’t be counted. You can use 10 million events in the $99 plan from Zeropark and it will count as 0 so you still pay just $99. I have just signed up. Please add me to your list to enable me to receive the additional matching of $500. You forgot the name you used at the moment of registration? Thanks. You’ve been added to the list. Thanks for adding. In my county PayPal not available so i want to pay via MasterCard, So could you please help me with that issue. Not sure if I can help with that. Please contact them after approval to see if you can pay via cc instead of paypal. Hi Servando, Thank you for this opportunity. Hi Servando, I also just signed up but I don’t like to post my email in the public (spam). Is there another way i can send you my email address? Thanks for everything! No problem. Just added your email. What’s the name you used for registration? Thanks for adding me 🙂 The name i used is Lucien. Hi Servando, I just singned up and get approved! Name: Qi Yin Long Email: imfuture9299@163.com. Thank you! Hola Servando, Ya me registre! y esperando por verificación. Mi nombre es Guido y el correo es cvendio@gmail.com. Muchas Gracias. Hi Servando, I just singned up! Name: Johann email adress johannonline-at-yahoo.com! Thanks for the awesome coupon! signed up. Name: Ildar email a@teleport.company. Best to you! Hello Servando/ My accaunt a@teleport.company. I’ll be able to approve your account once Servando puts your name on his list. Please reach out to him, that should speed the process up. Just signed up to Zeropark. Hola Servando, ya me he unido; Raúl / contacto(at)raulmellado.com Gracias por todo! Hey Servando, Just signed up. Name: Sany email sanyptl80@gmail.com Best to you! OK, they should activate your account now and you’ll receive an email from Zeropark when you can proceed to add funds and get the bonus. Thanks. Just added you to the list. OK, I’ve added you to the list. OK, just added you to the list. They’ll contact you. Many thanks for your help, so means i would get $500 matching bonus if i deposit $500…. Fund deposited since yesterday morning but till now no matching bonus applied yet and so far no reply from them as well regarding this matter. Any suggestion? I can see your account was approved, so they’ll add the funds soon. If it doesn’t happen today then Monday most probably. Thanks! Today already Tuesday but till now i still don’t get my matching bonus. Emailed Agata since last week but no reply from her/him. I’m really a bit worried now because it’s already more than 5 days. Could you please help as i didn’t get any reply from them. Thanks. Let me send her an email. I actually see you account is approved but no deposit has been registered, but hang on and I’ll contact her personally. thanks for letting me know. Thanks Servando my account credited with extra $500 now its time to start journey . What’s the name you used to register? Please answer back ASAP. My account is suspended due to non activity is it possible to reactivate it? I hope that “suspended” is not the same with “banned”.. Thank you and looking forward for youre response. Banned means you were breaking the rules. If you just never ran any campaigns and it’s due to inactivity it should be good to go. Please let me know the name and email so I can add it to the list. Got it. just added you to the list! Signed in yesterday with miguel[at]1001.pt . Didn’t make any deposit yet, but also didn’t use the coupon code. OK, just added you manually so they will confirm it with you first. Podrías validarme para el cupón? OK, I just asked them t re-check your info. Thanks. You haven’t signed up with them. They just told me there is no account under that email. I don’t setup the accounts, so you need to create one before applying for the coupon. can i add fund now ? is the coupon work automatically ? Hola Servando, hace unas semanas rechazaron mi propuesta. Mi mail es adolmoranp@gmail.com.Como hago nuevamente para acceder al cupón.Me lo habilitas tu y ellos me dan acceso?ó tengo que mandarles un correo nuevamente?Gracias. I’ve added you to the list and they will send you an email to tell if the coupon applies for you or not. Hey buddy, name’s Itay and my email is itaymatan@gmail.com, thanks! Hello. 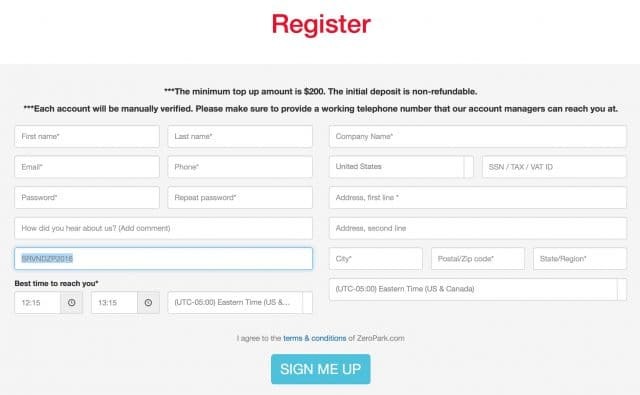 Once they verify you and approve your account for the bonus you’ll receive an email from Zeropark. Thanks. Hello. What’s the name you used to register? My name is Jaroslav Fládr, are you going to AWE Berlin? Tnx Servando. Got my account approved with your reference and paid my initial deposit. It looks like you didn’t create any account under that email so they won’t be able to give you the coupon until you sign up. What’s the name you used to register? That’s the email address. What’s your name? Cool. I’ve just added you to the list. efoxmedia2014 at gmail dot com, thanks! Thank you bro, when can I receive the bonus? You’re the only motivation to me to sign up at ZP lol, I hope I could receive good results soon! They will send you an email when you’re accepted for the coupon. I can see you’ve been approved so you just need to wait for their email. What’s the name you use at the moment of registration? Thanks! Zeropark not see my data, please refresh the list. Actually they did and you have been approved and deposited already. Hi, Servando. I’m already with ZP but I’ve never added funds. I’d like to take advantage of this offer. Email: amri.ahmad85[at]gmail[dot]com thanks mate! Will deposit in a minute. Edit: Oh I will need to get approved first. You were added to the list before. Zeropark will contact you once your account has been approved so you can deposit and receive the bonus. I think your account has been approved already so you should receive an email soon. yes i have received email from zeropark . so now when i add fund i will get the bonus yes ?? i have now 220$ in my paypal and i will add 120$ in the next 2 days can i wait before my budget be 340$ for buy the 300$ pack or i have to add funds emmidiately ?? You can do this today or tomorrow. Just make sure it happens before the promotion ends. You don’t have to do this immediately. Sure. If this is your first deposit I’ll add you. Thanks. Yes, it’s my first deposit 🙂 So I can just make the deposit now and get the bonus right? The Zeropark team will contact you once you’re ready to go. I think you’ve been approved already but they will email you to confirm when you can do your deposit. I used your coupon during sign up process as you write. Please add me into the list of Deposit $500, get $1000. thanks in advance and thanks for your interesting posts! Hello Bruno. You’ve been added to the list. Love it, great post Servando! I used your coupon during sign up process. Please add me into the list of Deposit $200, get $400. Thank you. I’ve added you to the coupon list. I’ll see what we can do. Added you to the list. Hey Servando, just signed up. I’ve signed up to Zero Parke few days ago and I’m just about to start my first campaigns ! Could you please add me to the coupon ? 500$ bonus with 500$ first deposit would help me boost my results right after start for sure ! Sure, no problem. I’ve added you to the list. Thank you. I’ve added you to the list. Just registered via your link and put your promo code. Should I put deposit first or wait their support calling me? Hello. Once you’re accepted and approved in the network you can make the deposit and they usually take 1-2 days to apply the coupon. I’ve added your name to the list. have signed up through your link and coupon code hint4.me[a]gmail.com (Yuriy Pak). Please validate me. Thanks! Hi Krishna. Let’s see what we can do about that. I’ve added you to the list. OK, let’s see if they can reconsider your approval. I’ve added you to the list. I was rejected few months back and my account is inactive right now. We’ll see if they can reconsider it. I’ve added you to the list. Thanks for the coupon. I was rejected three weeks ago by Zeropark. I hope they approve me this time and activate your coupon. Thanks for adding me to your list. Hi Anand. let’s see what we can do about it. Added to the list. Hi Patrick. Just added you to the list. Thanks. One more thing, what’s your name so i can add you to the list? Hello Servando. After applying within the last week I was rejected. I would love to take advantage of the offered coupon if they were to take another look at my application. The email I used was ameenm [@] mconv.com. Just added you to the list. Thanks. Should I send them an email regarding my application, and reference your list? Or would they most likely be contacting me? MAn ! i was very disparate and i wanted to get in so much ! thank you for this opportunity !! Hello, are you registered already or are you getting a new account? please leave your email here to add you to the list. yes i was rejected . OK, Let’s see if they can reconsider your account. I’ve added you to the list. did you add me Bro ? Already added your email (the rejected account) to the list of coupons so they can reconsider it. Thanks. Already added you to the list. Thanks.